The total costs of the Defence Forces' operations for the visits of Queen Elizabeth and Barack Obama are €1.73m, Alan Shatter has said. THE DEFENCE MINISTER Alan Shatter has said that the Defence Forces’ bill for operations around the visits of Queen Elizabeth and US president Barack Obama to Ireland in the last week is estimated to be €1.73m. Speaking in the Dáil this afternoon, Shatter said that €1.1m of those costs had been incurred for the four-day visit of Queen Elizabeth last week, while the other €630,000 was relating to operations connected with yesterday’s visit of Barack Obama. Shatter explained that the role of the Defence Forces had been to supplement the fundamental security work carried out by the Gardaí, for whom a total estimated cost for the visits had not yet been calculated. Those duties had included surveillance and security deployments on land, sea and air, and the “guarding of vital installations” as well as ceremonial duties during the Queen’s State Visit last week. The minister said that while the Defence Forces’ budget was not likely to require any supplementary funding in light of the costs of the visit, the same guarantee could not yet be offered for the Garda budget. Shatter said he and the government were “anxious to ensure that the capacity of the Gardaí to provide a full and proper policing service… would not be in any way impaired” – indicating that supplementary funding might be required for the forces for the remainder of the year. An Garda Síochána was allocated €1.532bn in last December’s budget. The Defence Forces budget was not likely to require any extra supplements beyond whatever budget had already been assigned for them, however. Shatter thanked both the Gardaí and the Defence Forces for their work in securing both high-profile visits as well as the State Funeral of Dr Garret FitzGerald on Sunday, which had put the security forces under even greater pressure. The minister added, though, that he found it “quite disturbing” and “deeply regrettable” that a potential target for terrorist activity like Barack Obama was able to engage with public crowds during his visit, while the Queen was not able to do so because of domestic “malcontents”. Email “€1.73m: The Defence Forces bill for Obama and Queen visits”. 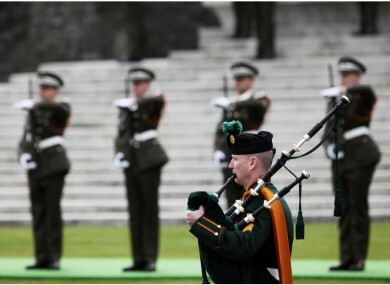 Feedback on “€1.73m: The Defence Forces bill for Obama and Queen visits”.